The Doric Order of architecture was little used by the Romans in Italy. The Tuscan order was a simplified version with base, unfluted shaft and simply molded capital. 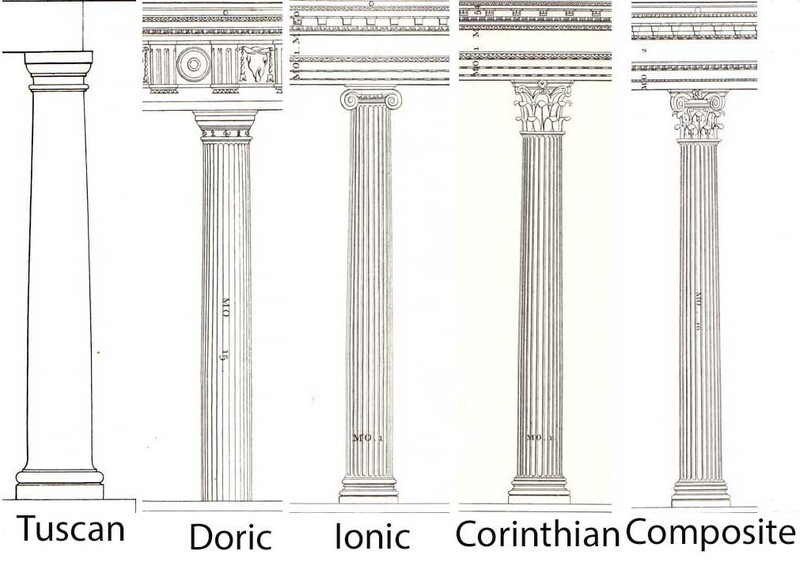 The Doric Order was the oldest (sixth century BC ) and plainest of the three orders of classical Greek architecture. The Doric order was developed in the lands occupied by the Dorians, one of the two principal divisions of the Greek race. It became the preferred style of the Greek mainland and the western colonies (southern Italy and Sicily). 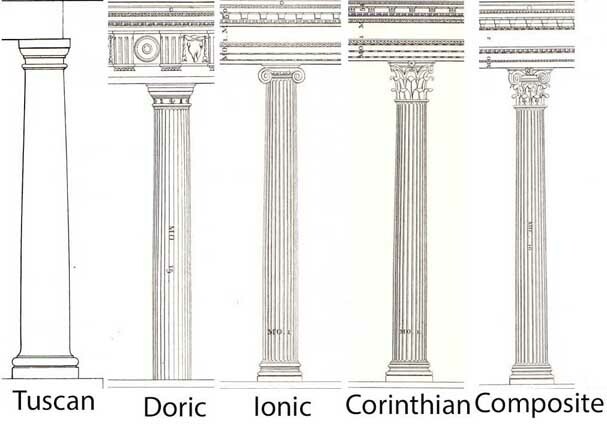 The other classical Greek orders are Ionic and Corinthian. 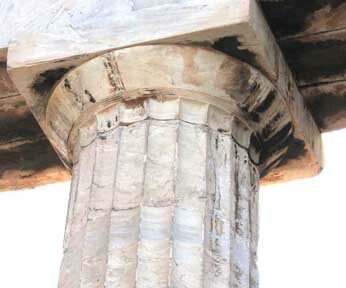 In the Roman Doric order, the columns are more slender, usually have bases, and the fluting is sometimes altered or omitted. 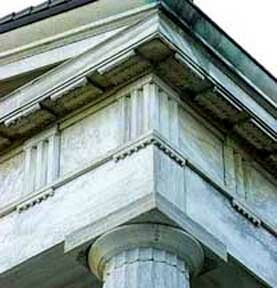 Doric entablature: A plain architrave, a frieze of alternating triglyphs and metopes, and a plain crowning cornice. 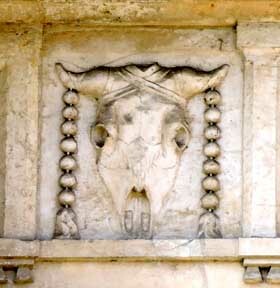 The triglyph and guttae beneath the triglyph are stylized memories of the beams and retaining pegs of the wooden constructions that preceded stone Doric temples. In stone they are purely ornamental. Doric columns are generally carved with vertical, parallel channels known as flutes, which should, properly speaking, number twenty. 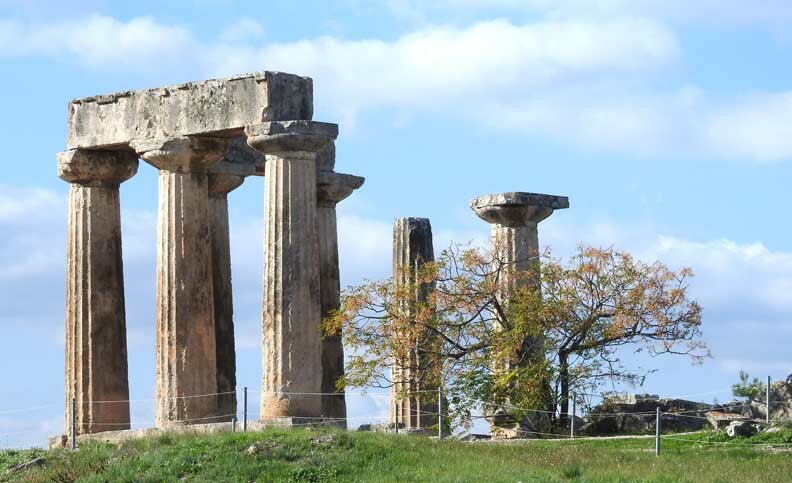 Entasis: From early times the Greeks incorporated intentional distortions, including entasis, a slight curving of the outline of the shaft of the column so that it was wider in the middle. This corrected an optical illusion that perfectly straight sides appeared concave. Doric capital: The upper section of the column consists of a cushionlike convex molding known as an "echinus," and a square slab above termed an "abacus." In some Roman examples, a "neck" is found under the echinus. Sometimes, there is carving on either or both the echinus and neck. See also: Greek Revival Style ... Vitruvius Pollio, "The Ten Books on Architecture"